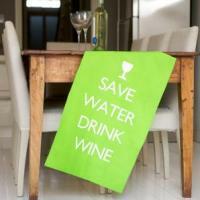 Our 'God Save The Wine' Tea Towel - say it loud sister! 1) Looks marvellous draped over the washing up. 2) Looks amazing draped around the neck of an ice cold bottle of Sauv Blanc. 3) Can be hung out of the window to alert your girlfriends that the weekend has started (even on a Monday). Made in 100% premium cotton. Printed and made in Britain.